How do you introduce your child to Jesus? Imagine your children took the same interest and wonder in Jesus and the Christian message as they did in princesses, fairies, and elves… Jesus Sees Us is a packaged Jesus Christ doll that has the same comforting power as a child’s favorite toy or blanket, but is rooted in lessons that last a lifetime. Children respond to the comfort of tangible items when they are young, so why not make that item Jesus and the comfort He gives to ignite their faith? The accompanying book is a tool to assist you in engaging your child and starting the conversation about Jesus’ teachings. The Jesus Sees Us doll is an integral part of fostering your child’s initial introduction to Jesus. Even though we talk to our children about Jesus or take them to Sunday services, they are not always able to understand the importance of the Christian message. Jesus Sees Us is a tool that makes Jesus, His teachings, and the concept of faith both relatable and positive to young children by introducing Him as the loving and forgiving presence in our lives. The doll becomes the tangible connection to the stories and lessons in the book. He is the touchable source of comfort that a child can relate to. The Jesus Sees Us doll has a soft body and a warm, welcoming face. His arms and hands are open, inviting your child to hold him, engage with him, and pray with him. 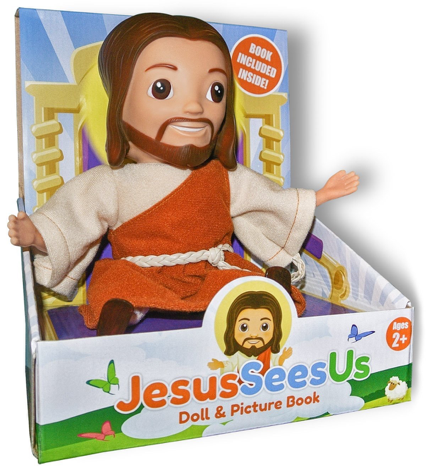 The Jesus Sees Us doll allows your child to “play out” the valuable and timeless lessons of the Bible. Though it is geared for ages 2 and up, I found that my infant daughter loved Jesus just as much! We were able to read the stories to her and share Jesus love. We believe in starting out teaching about Jesus long before the child reaches the age of understanding. If she always remembers hearing about Jesus, she will recognize Him much earlier. She's so cute holding Jesus hand! This makes a fantastic Easter gift! Be sure to order yours soon!